How to get there: Münich is a good international airport. If you arrive there continue to Salzburg in Austria. From Salzburg, take Hwy. 158 south-east in the direction Bad Ischl. As you approach Bad Ischl, you will drive through a tunnel, immediately after you exit from the tunnel, take the second right exit, sign for Gosau and Graz. You will then enter Hwy. 145. From exiting the tunnel, you should drive about 10.8 kilometer along Hwy. 145, before making a right turn onto Hwy. 166. After 5.3 kilometer on Hwy. 166, there is a pretty sharp right turn, stay on Hwy. 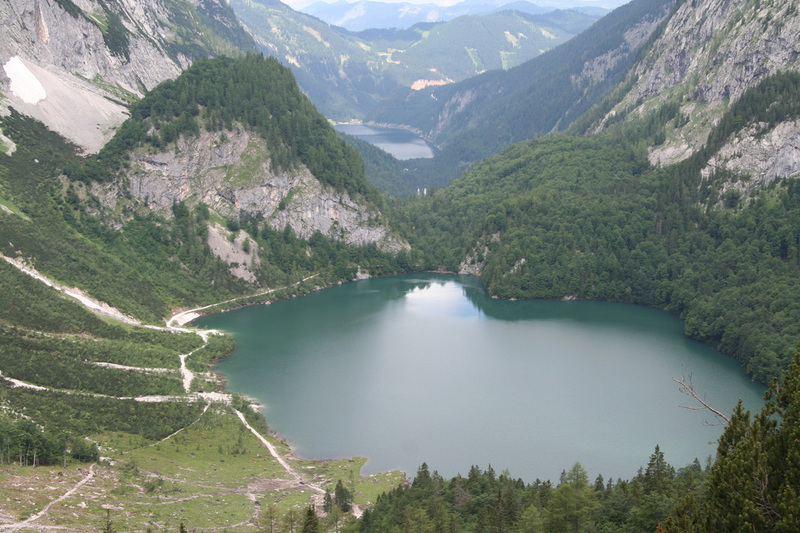 166 for a total of 15 kilometer, you have then reached the small village of Gosau. Turn left here (sign for Gosausee), and drive 6.7 kilometer to a parking area on the right side of the road. If this parking is full, there is quite a large capacity parking slightly further downhill (you passed these before getting to the parking area described above). This parking has elevation 910 meter and location coordinates N47:32.030, E013:29.748. This is the trailhead, park here. There are other possible trailheads, including a gondola lift that will bring you high on a glacier. 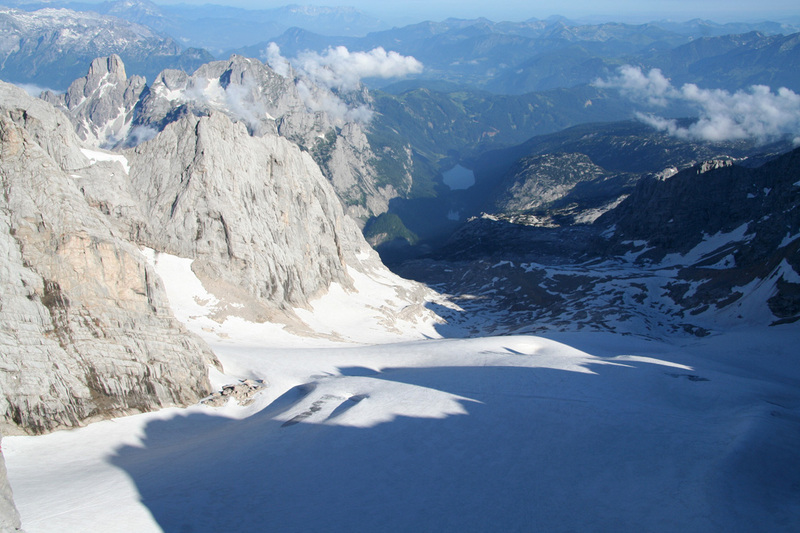 However, this gondola should not be used when climbing Hoher Dachstein as the remaining climb will have too little net gain of elevation to qualify as a real European Ultra climb. To the hut: From the parking, first hike along the first lake, Vorderer Gosau, one can do this on either the left (forest road) side or on the right side (trail). The trails merge at the southern end of the lake and the forest road climbs gently to an area with several smaller, partially interconnected lakes. 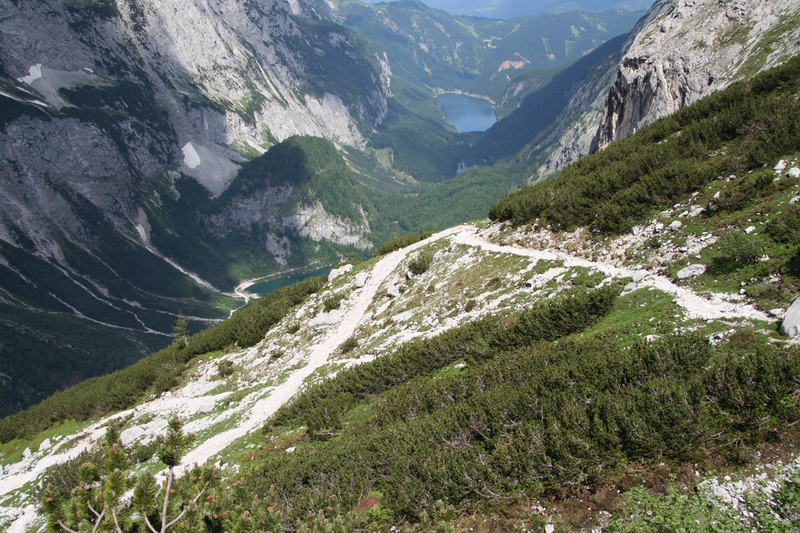 This is followed by a section of more distinct uphills before the road levels and arrives at the third lake, called Hinterer Gosau. The trail curves along on the right side of the lake. Before you approach a few houses near the shore of the lake, look for a smaller trail that forks right. There is also a sign there saying Adamek hut. The hiking time to this point is likely between one and one and a half hour. The trail now zig-zags steeply up the slope above you. 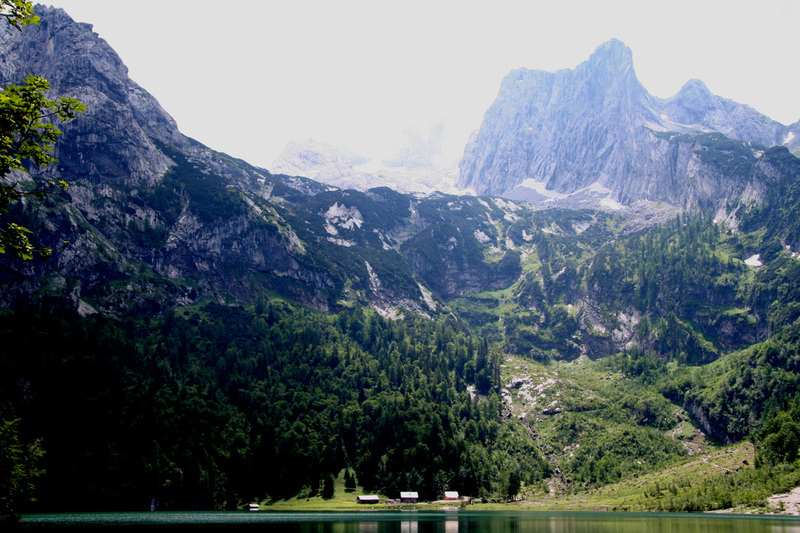 The normal hiking time from the lake to the Adamek hut is between 2 and 3 hours. The view from this trail is breathtaking, a few places the trail runs right above cliffs with exposure, a short section even has a cable that may provide added security for hikers that might worry about the steep drop below. However, the trail is quite wide and very nice all the way up to the Adamek hut at approximately 2200 meter of elevation. You have now climbed 1300 vertical meter from the parking area and a well deserved rest is in order. Most people will stay at the hut and attempt the peak the following morning. However, if the weather is stable, a strong hiker can certainly continue and make the ascent in a single day, see the report below. 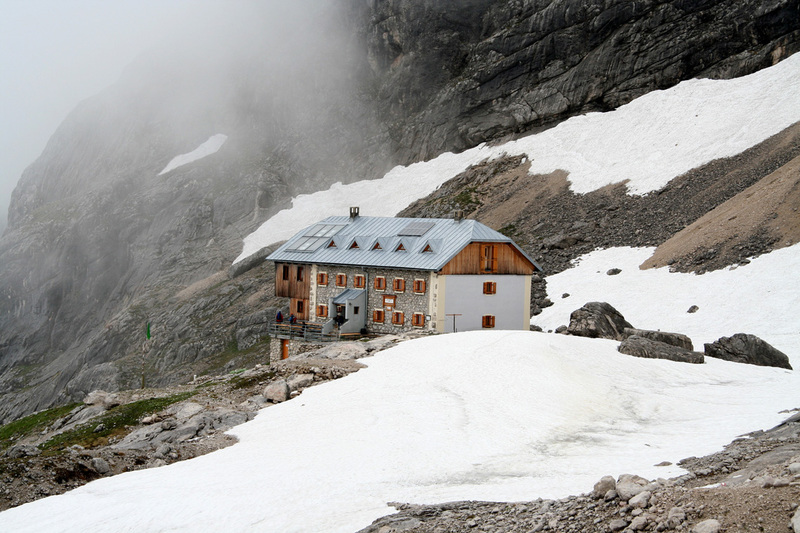 From the hut to the peak: The route from the Adamek hut to the summit is more advanced, that is, there is really no trail and a glacier must be crossed. This glacier has crevasses (as almost all genuine glaciers do), however, relatively few and there are many good alternative routes across it. First, head more or less directly up the slope above the hut, cross a somewhat more level plateau and descend into a small, but distinct "valley" just below the glacier. 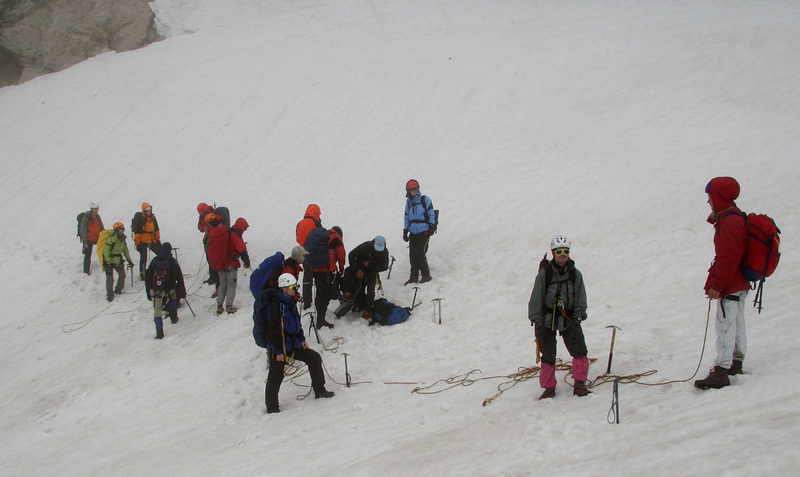 Ascend the glacier and find a good route that climbs while traversing to the right hand side. There are clear compression zones that can be followed, where the glacier normally will have few (or none) crevasses. 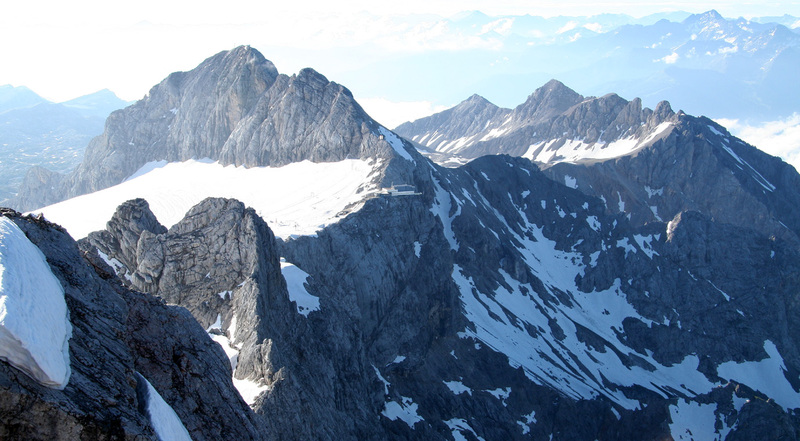 Aim for the right hand side just close to the impressive tower shaped peak that is located to the right of Hoher Dachstein. 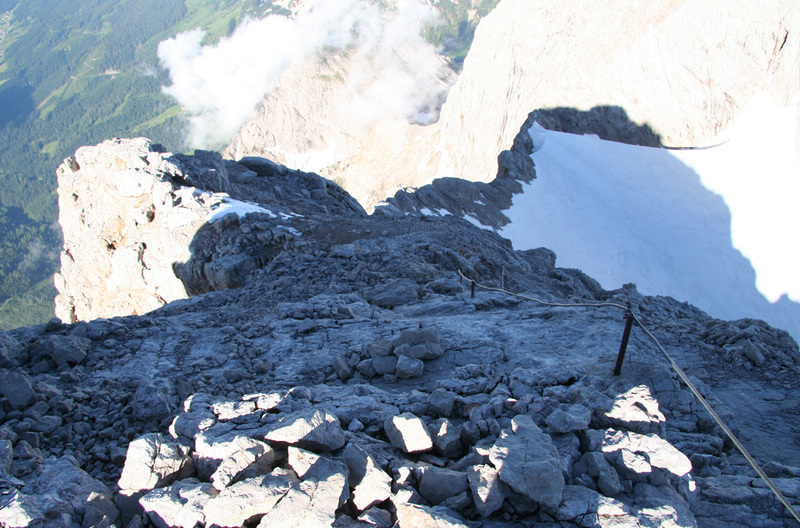 Complete the ascent of the glacier on its right side and soon you will see the last snowfield leading up to the beginning of the West Ridge climbing route. (Elevation 2779 m, location N47:28.422 E013:36.086). Note: There are possible variations when climbing/crossing this glacier. 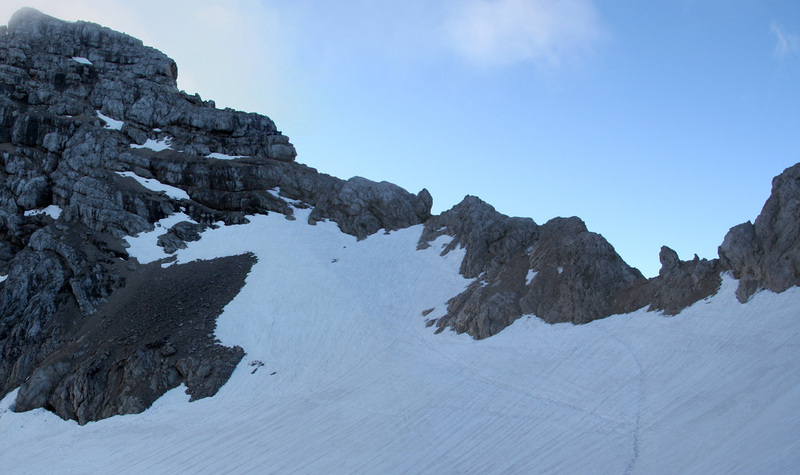 One may also follow the left side upwards until about 2700 meter elevation, then cross right on an almost flat section in order to connect with the route just below the final snow field. The ridge has a very characteristic rock feature right where the climbing route begins, one may also look across the ridge here and view the impressive panorama that opens up. The cable now guides the way upwards. 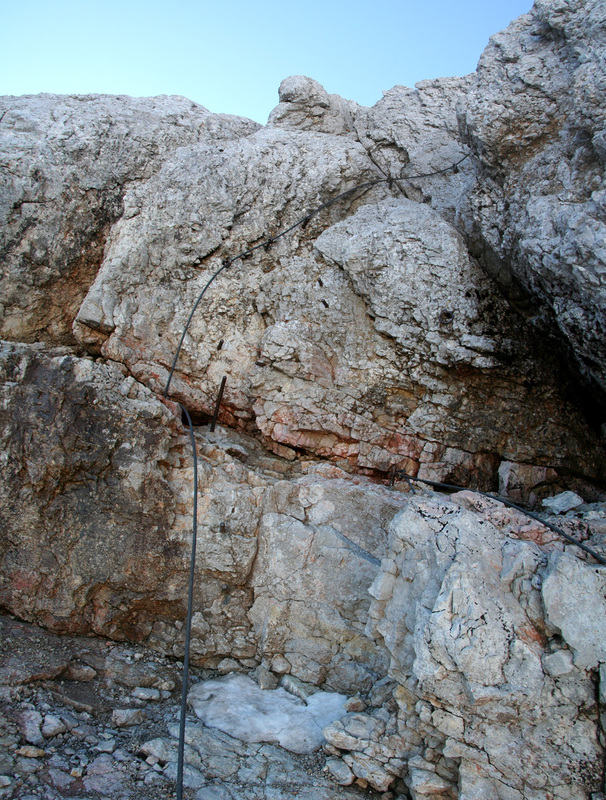 For large segments, this cable is likely not needed, however, there are a couple of steep (and exposed) sections where protection may be a smart idea for most climbers. The crux of the climb is fairly early on the route, a pretty vertical section with good holds, but also with extra irons that are hard to avoid. The route stays mainly on the left side of the ridge, but tops out on the ridge proper with tremendous exposure down the 1000 meter south face. 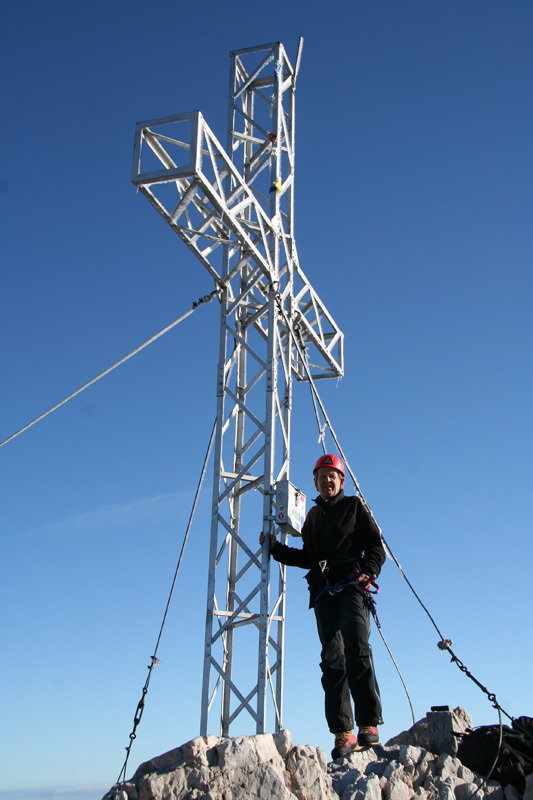 This climbing section takes about 45 minutes as you ascend a bit more than 200 vertical meter. Trip Report/Comments: I arrived (from Norway) in the small village of Strobl about 1 AM on July 1st. After a few hours sleep, I set out and arrived at the parking lot around 7 AM. It took me 1 hour to hike to Hinterer Gosau lake (the third and final lake), then another 2 hours up to the Adamek hut. This is quite fast hiking and a cold beer was just what I needed upon arrival. I passed about 15 members of a bird watching club while hiking uphill. The day was still young, however quite a blanket of fog obscured most views. I still decided to head uphill towards the peak, with luck the weather might improve or perhaps the peak would reach above the fog? I hiked along the left side of the glacier, got too high in the side and had to put on crampons in order to descend back down a hard snow slope. The fog did not allow for visibility, I did not see a single trace of people and I was indeed on a glacier, so some care was definitely in order. 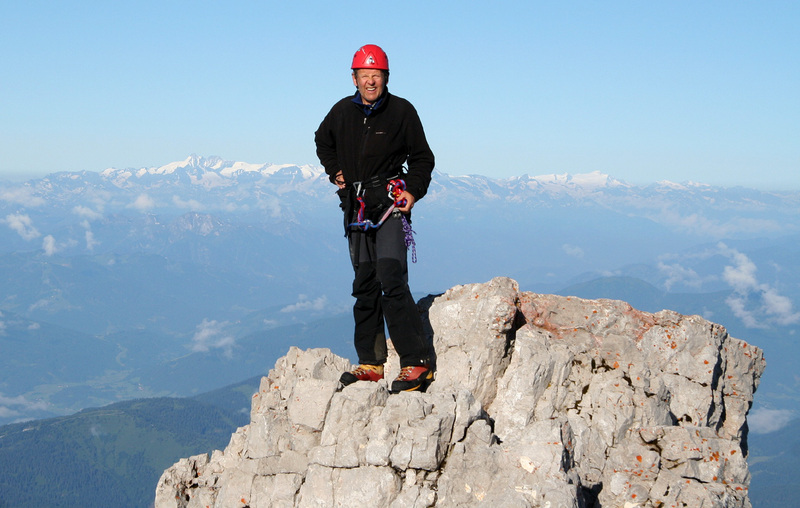 Therefore, a big surprise as I suddenly came across 15 people from the Edelweiss mountaineering club in Vienna. 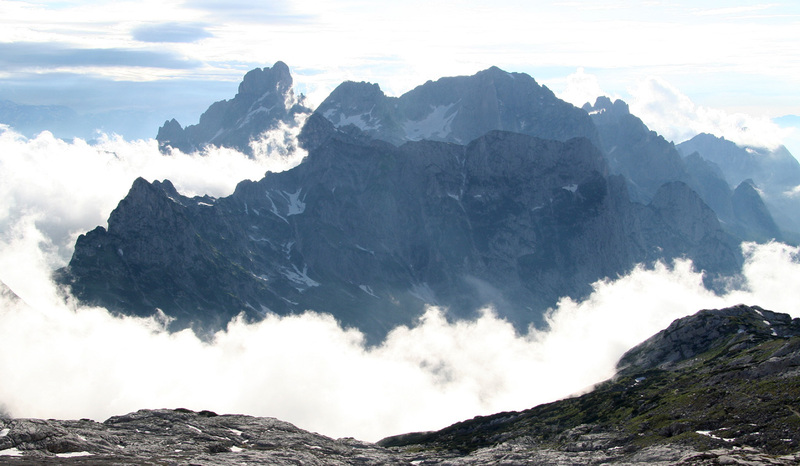 They had just completed the "Steinerscharte", a route from the Simony hut, and was now roping up for the glacier descent to the Adamek hut. 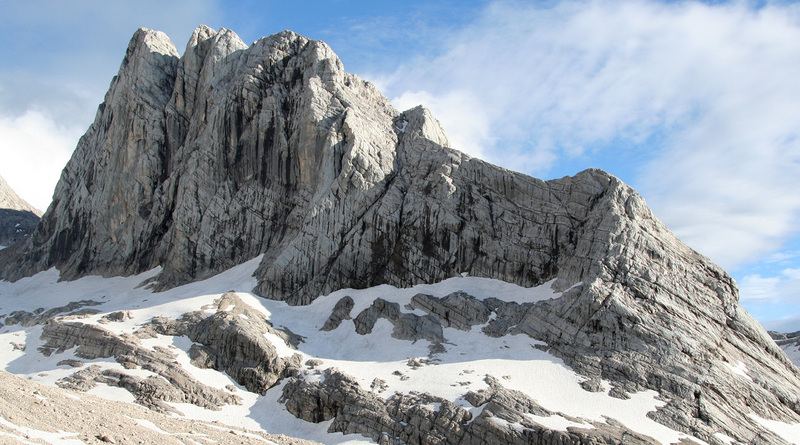 I continued uphill, searching for the col where the climbing route to Hoher Dachstein was supposed to start. It started raining and the fog reduced visibility to a couple of meter. 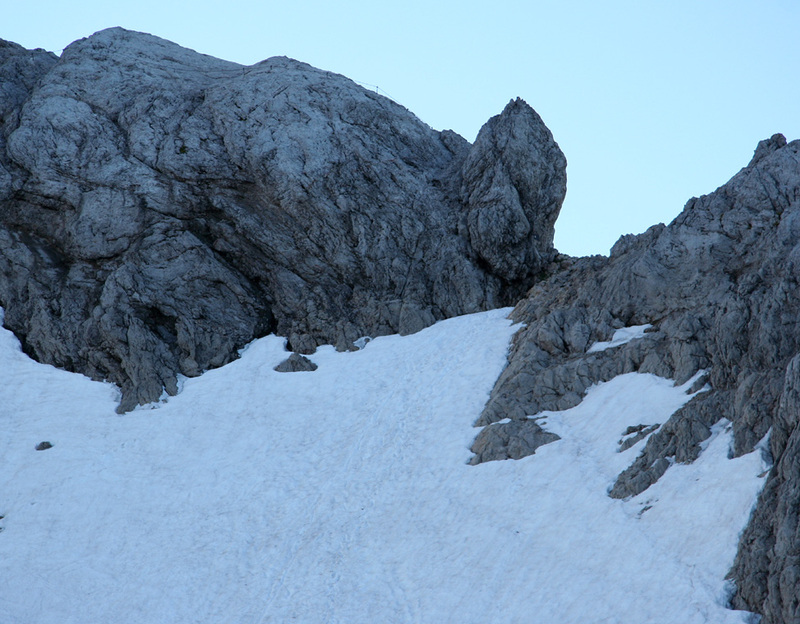 I climbed steeper snow to what seemed like a possible col, but found only steep rock above me. I concluded that the right col most likely was even further west. However, with the weather getting worse there was no point to continue searching and I returned back down to Adamek, enjoying dinner with the bird watchers and the Edelweiss people. A final note (and lesson) from the evening. I ordered another beer with my dinner and got a considerable surprise as it tasted distinctly bad. It turned out that they "assumed" that beer for dinner should be mixed half beer and half lemonade (like the soft drink Sprite). An offer to change it for "real beer" was politely refused by me, as I told them (to their great surprise) that I had NEVER tasted anything like this before, I should rather at least try it. My conclusion remains that mixing two "good" drinks does not necessarily produce something of equal quality. You are hereby warned. The next morning, the weather looked much improved and I left the hut at 0500, made my way up and across the glacier (following compression zones) in order to reach the correct beginning of the west ridge. With visibility, the correct entry point was completely obvious. I noted that I had been on the neighbor snow slope the previous day. 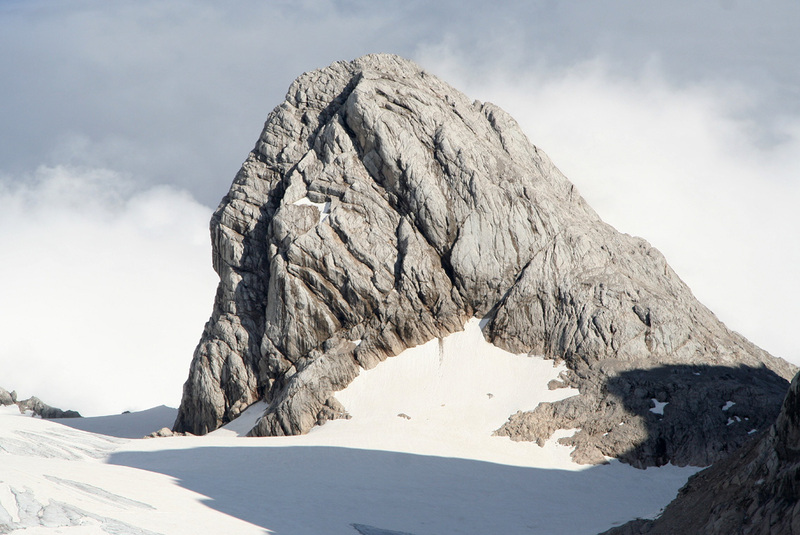 The final snow slope to the notch was steep enough to require crampons, alternatively, it looked as if one could gain the rock a bit further to the right and then scramble on the ridge to the beginning of the route. I took a peek across the ridge, and the drop on the south side is truly awesome, a nice panorama even before starting the climb. I met two men coming from the opposite side, just as I arrived on the summit. They took a couple of pictures of me, then headed back down. Thus, I could sit and enjoy the view, the summit and the near perfect weather for another 30 minutes without anybody else in sight. 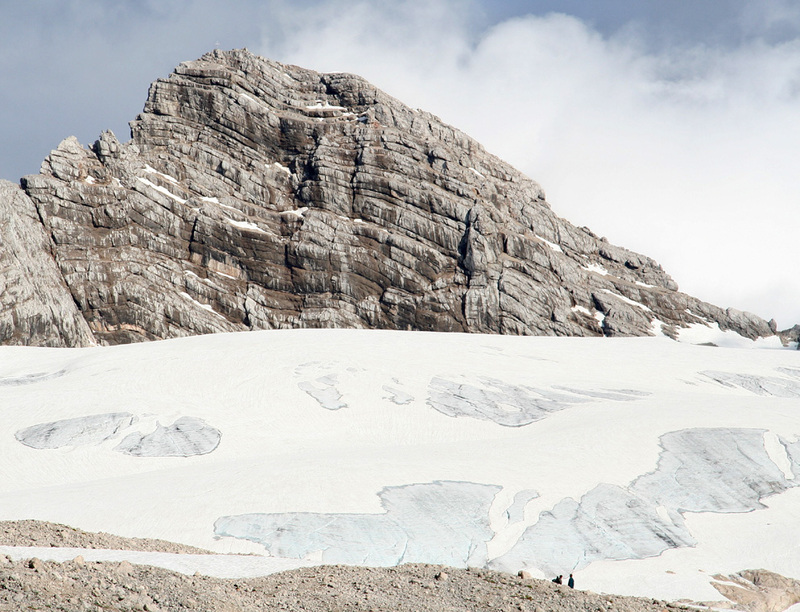 After downclimbing to the notch, I put the crampons (that had been left behind) on the backpack, grabbed the ice axe and started descending the upper snowfield. Big mistake, the snow was just as hard as it had been earlier in the morning. What had been an easy ascent with crampons turned into a slow and careful downclimb without them. The Edelweiss team was about to reach the ridge, they decided to avoid the final snow slope and rather scramble a short initial section of the ridge. I decided to walk back down following their tracks, just to have a variation on my glacier route coming up. This turned out to be my second "crampon mistake" of the day, as they had crossed a short section of "blue ice" near some crevasses. Whereas my ascent route had been on good snow and crevasse free, I now had to put my crampons back on in order to negotiate this rather short section of ice. With no further events, I safely reached the Adamek hut where the bird watchers were preparing to return down to the valley. It took me just the same time (45 minutes) to climb back down to the notch, then another 45 minutes to descend the glacier back to the Adamek, arriving there at 0930 for a late, but well deserved breakfast. I paid and said goodbye to the friendly staff at 1030, then descended to the Hinterer Gosau lake in 1.5 hours, reaching the car at 1300. A very memorable and nice climb had come to an end, the rest of the week would be devoted to the 17th. International Conference on Domain Decomposition, DD17, in the nice village of Strobl. Note: This mountain is listed with many different elevations. Appearently, the local tourist industry really wanted to promote it as a 3000 meter peak. One source claims that the official elevation has been measured to 2995.78 m. However, I had my GPS do more than 700 samples while on the top. It reported an uncertainty of less than 2 meter in its estimate, but still reported 3003 meter. I wonder if there may be an inconsistency between the reference "sea-level" used in Austria and the Geoid model used by the GPS, the difference down to 2996 meter seems too large when compared with similar measurements done elsewhere. So perhaps the summit one day will indeed be listed as a 3000 meter? 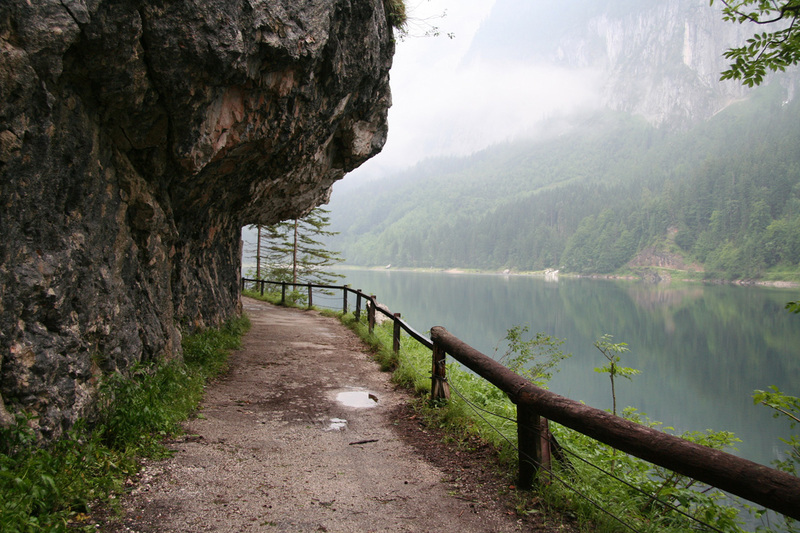 The forest road, along Vorderer Gosau lake, the first lake. 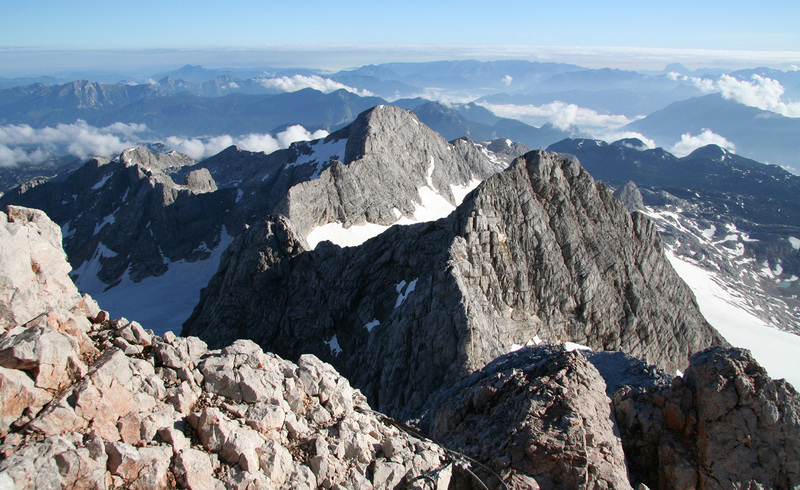 The mountains above Adamek hut, Hoher Dachstein is the third summit counting from right to left. 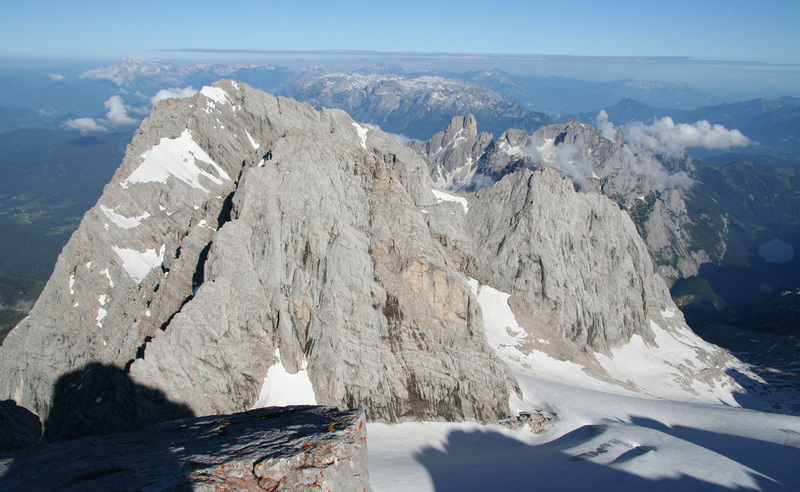 Hoher Dachstein, as seen from the Adamek hut. The next peak right, as seen from the Adamek hut. 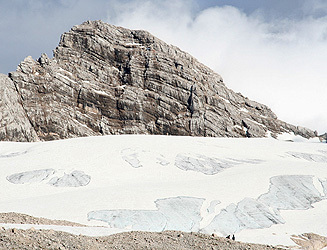 The second peak right, as seen from the Adamek hut. Looking north, from the Adamek hut. 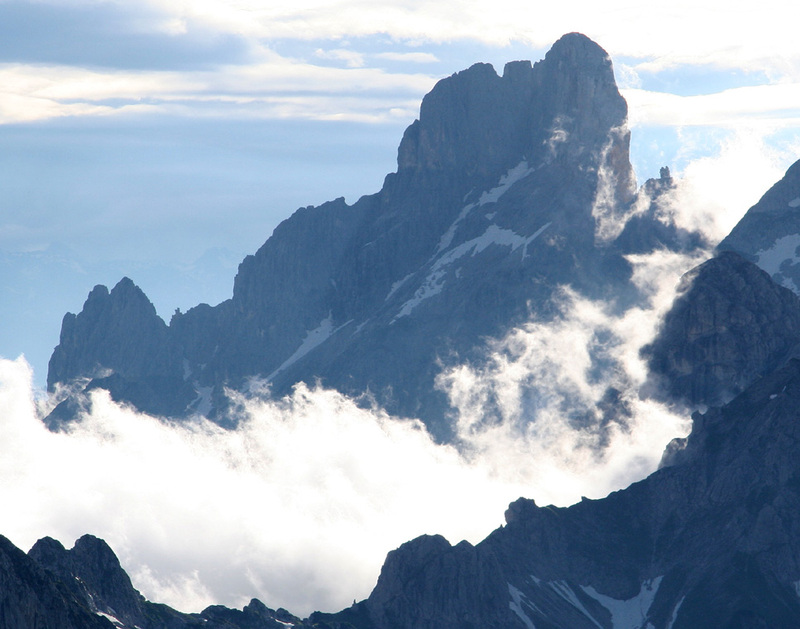 Impressive peaks, a detail from the previous picture. Summit picture, me by the summit cross. Summit picture, me on the high rock. Looking down the west ridge. View east, a cableway terminates on the ridge. View north, the route all the way back to Vorderer Gosau lake. 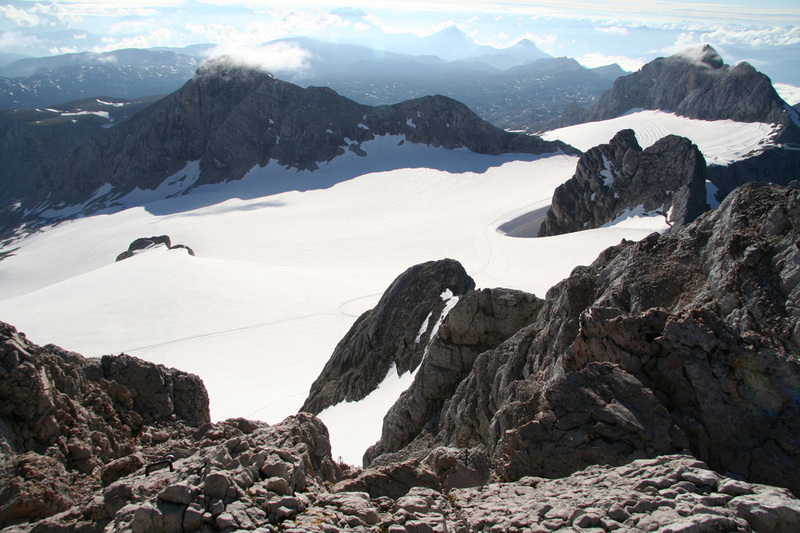 The largest Dachstein glacier, this is called Hallstaetter glacier.